My Little Review of Bill At Rainbow Bridge, by Dan Carrison. I was very lucky a few years ago now to be given this book to read. It was at a time when I needed that comfort after suffering losses of our family pets. Even-though I’ve had this book for years now, it’s one I love to read over again, because it’s such a heart warming book that takes the reader from feeling at a loss, to having somewhere to imagine loved and lost pets travelling to. 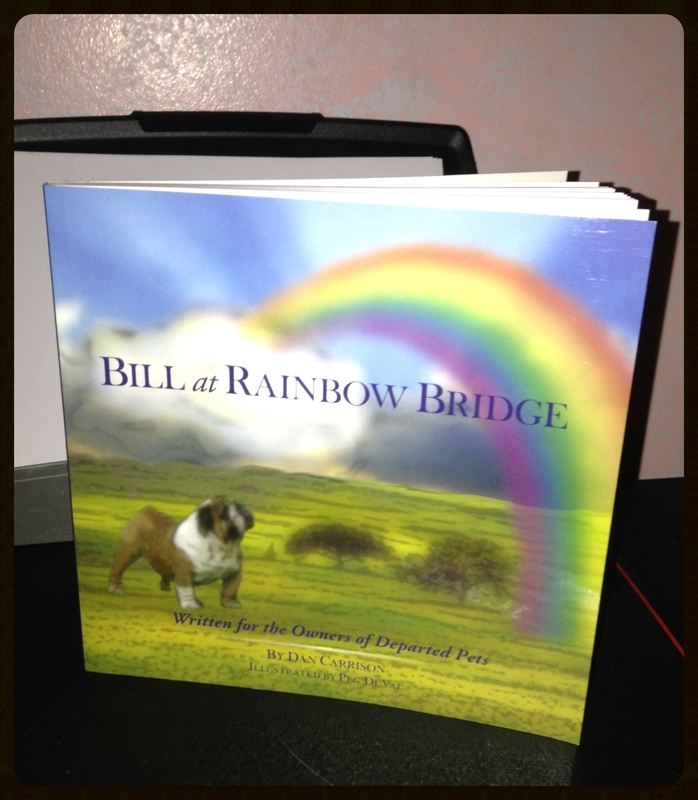 The story itself focuses on Bill the bulldog when he first arrives at ‘Rainbow Bridge,’ and how he explores ‘a place like no other.’ The reader see through Bill’s eyes what Rainbow Bridge is like. Including how he makes friends with other pets. There’s a really moving scene in the book, where Bill sees what happens when a dog is finely reunited with the human he loves the most, that part is very emotional and so well written. Also the book touches upon the human emotion of losing a pet, through Bill’s owner David’s eyes. As well as introducing a few other characters, their pets and stories, as they work their way through their grief. It gives a wonderful emotional insight into how pets are very much one of the family, and how people grieves for them in a similar way to if one of their human family members had passed away. The book has some nice Illustrations that accompany the story. I think this small book is heart-warming, a must read for anyone who has loved a pet. What books do you find comforting? That’s lovely how Bill meets other friends at the rainbow bridge. It’s so positive and sweet. I too found this book a comfort when we lost our beloved cat a couple of years ago. Thank you for recommending it to me.